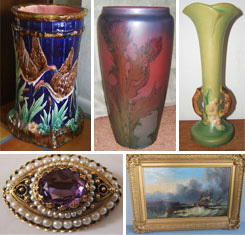 Looking to sell your used furniture, paintings, jewelry, silver, porcelain, old rugs, marble sculptures, bronzes, art glass, or the entire estate? OR just need an appraisal for free, on your valuables?! At Sobe Antiques we specialize in appraisal of residential contents and antiques of fine art collectibles, judiaca,decorative art, porcelain, object d'arts, antiques and jewelry. The one source for the sale of your estate, personal property, or entire collection liquidators art and antique professionals for over 35 years. One item or the entire estate, Buy sale, Consign, Auctions and estate sale selling services, certified appraisals, appraisals for federal estate tax and insurance coverage. When you need household items sold, removed and left in broom clean condition. We get it done. Our greatest intention is to assist you with your Eastate liquidation and make the process as stress free as possible. When you need the household items sold, removed and left in broom clean condition. We get it done. If you found your way to my Estate Liquidation - Estate Sales site I will venture to guess that this is not a happy time for you. If it is a happy time so much the better. More than likely you are experiencing a hardship of some kind, you may be down sizing, moving, ending a marriage or taking care of the final details of a loved one. My greatest intention is to assist you with your Estate liquidation and to make the process as stress free as possible.